This was our first Mercedes Benz and the experience was wonderful. We highly recommend this dealership. Giselle and Max were very professional and helpful! I had a great vehicle purchase experience.Everyone from the receptionist (Sarah and her partner), sales (Jonathan), sales manager (Ryan), finance person (Candice), and delivery person (forgot her name but was awesome).Thank you everyone! We just bought a used Audi from MBCH. Our salesman was Abe. He was very personable and helpful. We never felt pressured and Abe gave us the information we needed to make a decision. The car was in excellent shape and even had a nice bow on the hood when we picked it up. Abe knows how to make people feel special. I highly recommend him and this dealership. They are fair and honest people. 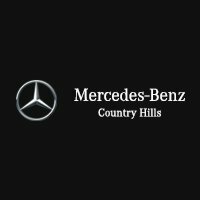 I had an amazing experience with Abe, and all of the staff at Mercedes Benz Country Hills. From start to finish, everything was seamless and enjoyable. Their customer service is beyond anything I've ever experienced. They definitely go the extra mile for their customers. Purchased a Used Vehicle from Abe, he was great to deal with , helpful, friendly and I would recommend Abe for anyone looking to purchase a vehicle. Thanks again Abe, Ryan, Courtney and Country Hills Mercedes for the great service, it was a pleasure doing business.